A new book written by a high-profile criminal defense attorney reveals details of the suicide letters former New England Patriots star Aaron Hernandez reportedly wrote before hanging himself in prison last year. "Unnecessary Roughness: Inside the Trial and Final Days of Aaron Hernandez," was written by Jose Baez, Hernandez's lawyer. According to NBC Sports Boston, the book includes the suicide letters Hernandez wrote to his daughter, fiancée. and lawyer. 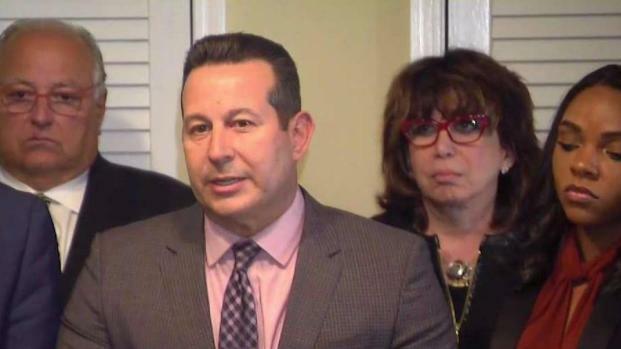 Jose Baez, the attorney representing the family of Aaron Hernandez, says the former football player suffered from the degenerative brain disease. Daddy will never leave you! I’m entering to the timeless realm in which I can enter into any form at any time because everything that could happen or not happened I see all at once! Life is eternal—believe!! !” Hernandez wrote. “Love, repent, and see me/yourself in everyone because that’s what the truth is! I’ll see you all in the heavens awaiting you all with the same love. Never fear me, but love me with all of you! Fear is the only separation between you and I! We are each other—I/you—you/me—there’s no need to fear but what you do unto another will come back around! Well, I wrote this letter following my acquittal and wanted to voice how I felt and let some people whos[e] music helped me get through hard times, know that it did. Wrong or right — who knows — I just follow my natural instincts and how it guides me. Pros or cons, didn’t weigh them, but I’m sure you’ll let me know your view. Besides that, I want you to know you have me forever like you never understood and time will reveal that I’m not perfect but my love and loyalty is like you’ve never seen! I appreciate all your work, time, effort, and never let that slip your mind! In time, you will see how appreciated you are, as well as all the others equally! I would like to send you letters so you can send to their [the artists] information or whichever way you think best. I don’t want any media really getting into me, trying to just send my love to all the artists who got me through my tough times and sending my respect to a few of the real ones out there. Baez's book is scheduled to be released Tuesday. The Boston Globe says the book mostly shows Hernandez in a positive light, saying rumors that he was in a gang were not true. The book also references Hernandez's reported request for a trade during a meeting with Patriots coach Bill Belichick in 2013. Belichick was reportedly "incensed" by the idea of a trade, even reminding Hernandez that the team had just made "a significant investment" in him. Baez also blasts Patriots owner Robert Kraft for releasing Hernandez before he had been found guilty. And the book says Hernandez told Baez he was close with quarterback Tom Brady. "He would always tell me, 'Stop hanging with those guys, get your (expletive) together,' One of the things I regret is not listening to him more," Baez said Hernandez told him. Hernandez was convicted in 2015 in the 2013 murder of Odin Lloyd, who had been dating Jenkins' sister at the time. The former tight end hanged himself in his cell at Souza-Baranowski Correctional Center in April 2017, five days after he was acquitted in a 2012 double homicide in Boston. A judge wiped out Hernandez's 2015 conviction following his suicide because it was still in the process of being appealed at the time of his death.